Before you get cooking, there are some extremely important safety rules you MUST follow. If you don’t, the chance for injury to yourself or property could result. As you start cooking, make these rules part of what you do automatically. 1) Never leave the kitchen when there is a pot or pan on the stove with a burner on. If you have to leave the kitchen, turn off the burner. 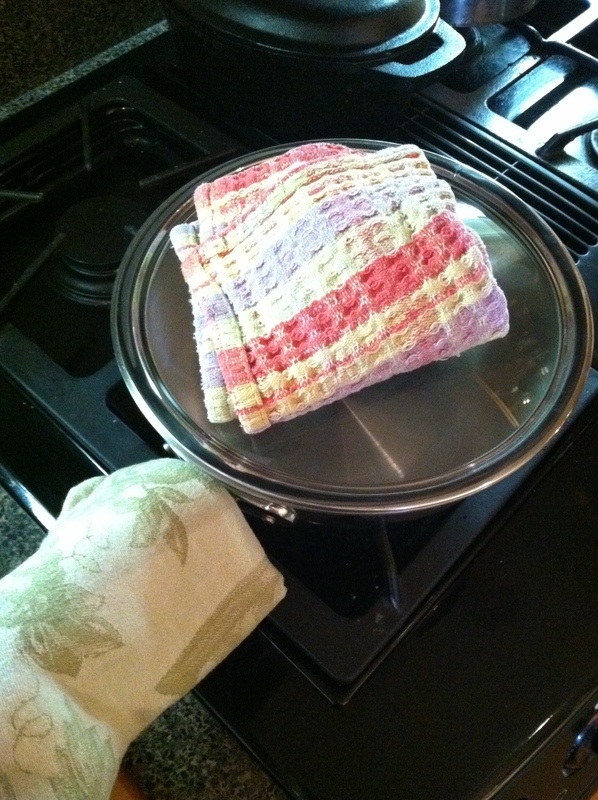 Leaving things on the stove unattended is one of the leading causes of house/apartment fires. Find something to do in the kitchen, wash some dishes, wipe down counters or refrigerator shelves, sweep the floor etc. just stay in the kitchen while pots and pans are on the stove. If you are heating oil, you have to stay right there with it to avoid over heating and catching fire. Keep a box of kosher salt or a large box of baking soda handy to throw on to a grease fire. Try to cover the pan with the lid to smother the flames. Throw the baking soda or salt onto the flames to put out the fire if you cannot cover the pan. NEVER! Never, ever try to put out a grease fire with water! The water will spread the fire and it will ‘explode’ all over you resulting in some pretty nasty burns. You might want to get a small fire extinguisher to keep in the kitchen, under the sink. 2) Always leave a sign on hot pots or pans to indicate it is hot. 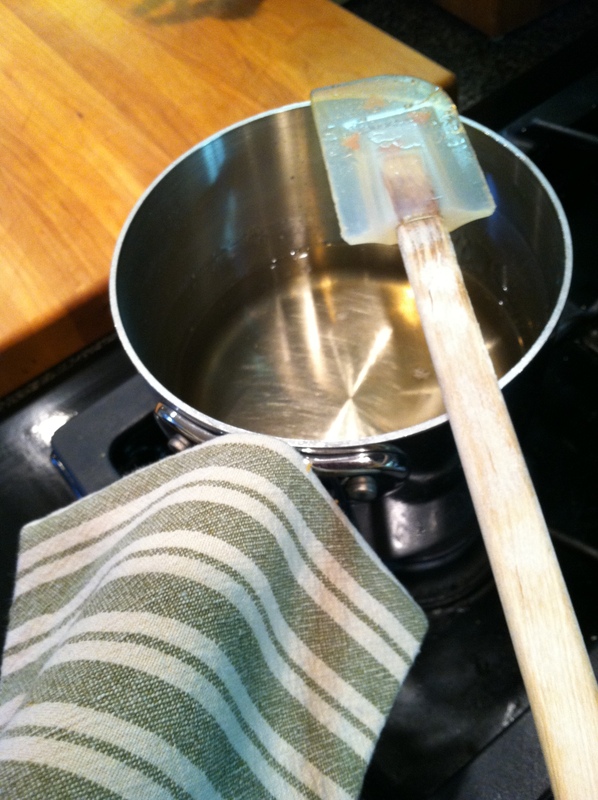 Signal the pan is hot by placing a towel on the handle or on the edge of a pan. 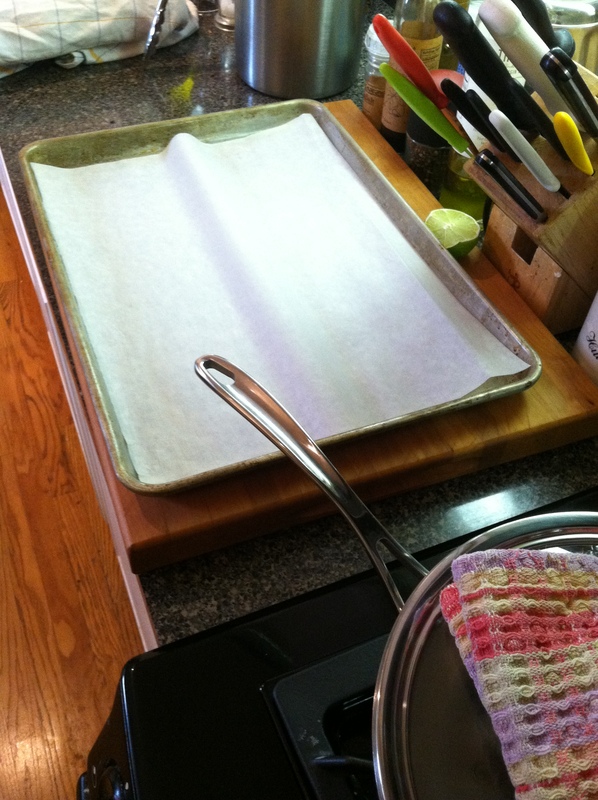 Leaving a clean kitchen towel on the handle or along the side of a sheet pan signals the item it hot. You can forget when a handle or pan is hot while cooking. Protect yourself and others from burns by using the towel signal. 3) Probably the most important of all: NEVER, ever catch a falling knife. Jump back out-of-the-way and let it fall. So what if it nicks the blade. You will still have your fingers. Knives are replaceable, your fingers are not. There will be a post on knife safety soon. 4) Keep all handles and pans so they do not hang over any edges of ranges, counters etc. 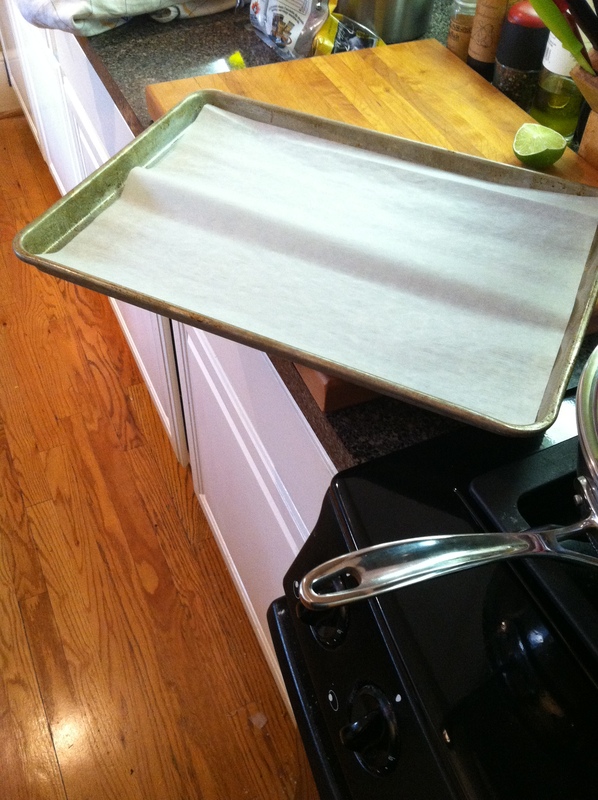 Nothing hangs over the edge, the sheet pan and the pot handle should be moved so they don’t hang over the edge. Turn them so they cannot be accidentally tipped over. Nothing should be hanging over an edge, turn things so they do not. Use towels to grab hot handles and hot lids. Always assume handles will be hot and use a folded towel to grab them. 5) Do not allow electrical cords to drape across the counter or any other place. Put electric units close to the plug. This practice prevents tripping over cords and pulling hot pots over onto yourself or others, resulting in horrible burns. These are best practices for learning your way around the kitchen. Kitchens can be dangerous places so please use these safety tips. Save yourself and others the agony of burns and cuts. I know you are First Aid trained. Make sure you keep it up. Have a kit handy to treat simple cuts and minor burns. Your training will be called upon eventually either for yourself or someone else. Most important, be able to recognize when you need to seek medical attention and do not hesitate; act quickly. Whipped egg whites, applied to cover the burn, once the whites dry, apply another layer. Leave on as long as possible. Seek medical attention if the burn is severe. Protect the burn from exposure to air. 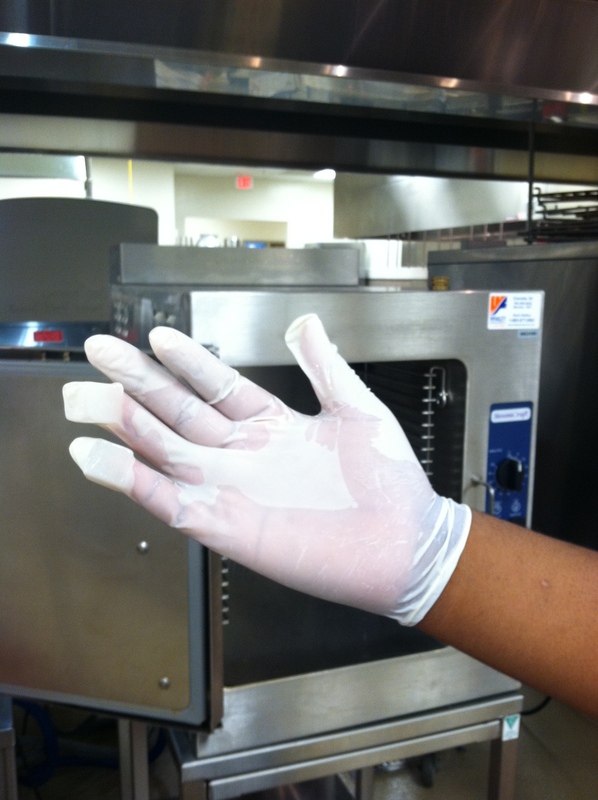 In my work teaching culinary school, I see and tend to many kitchen injuries that can easily be prevented. Food Safety is something you need to know about too. Read this post and organize your fridge. I will write more about food safety in another post. For now, be sure to keep all meats cold and on the bottom shelves so they don’t drip on other foods. Keep all left overs cold unless you are eating them. Get some cellophane wrap (Saran Wrap like) and use it to cover your food in the refrigerator. If you need to make a sign with the safety rules to post in the kitchen, print them from your computer. Safety reminders are always a good idea. Reminders help roommates and friends remember too. This entry was posted in basic skills, To Tyler: How to Cook:, What every good cook should know and tagged baking soda, cook, food, Food safety, grease fire, hot pots, Kitchen, kitchen safety, pots and pans, prevent kitchen burns, Refrigerator, safe cooking habits, Stainless steel. Bookmark the permalink. ← What is a Colander? How do you choose one? Aaah, a perfect mom post, full of wisdom all of us can learn from. Thanks Pamela! Can I offer one suggestion? We use leather welding gloves – bought from the hardware store for under $10 – as oven mitts. They’re long enough to protect forearms from being burnt on racks as trays are being pulled out of the oven, they don’t burst into flames when you leave them on a lit gas hob like a tea towel would (I know that from experience! ), and they have moveable fingers which gives a decent grip on hot things. I’m always wary of having tea towels too close to the hob – we have gas burners, and it’s just too easy for them to catch on the open flame. Great idea to use welding gloves! Actually never thought of it. I have been in the habit of using bar towels for so long, it does not occur to me options exist. I did buy him a silicone oven mitt shaped like a shark since his school mascot is shark. I am tossing around the idea of some sort of interactive pdf. By the time comes, I am sure the right media will come around. I have burned many a pot by forgetting I put it on the range. DUH! There was a close call once and after then I declared to never again leave the kitchen with something on the burner.